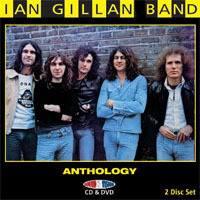 IAN GILLAN BAND was formed in 1976 and many of the audio tracks on this CD were recorded in Wales at the now famous Rockfield studios during late 76 and early 1977. This was followed up with a 19 date UK tour promoting the ‘Clear Air Turbulence’ album kicking off at Cardiff University on 29th April 1977 and finishing at Birmingham Odeon on 23rd May. The tour included a show at The Rainbow Theatre, London where the DVD footage was recorded on 14th May 1977. IGB touring was a wild affair but come show time the band were a tight professional outfit performing their own unique brand of rock music.